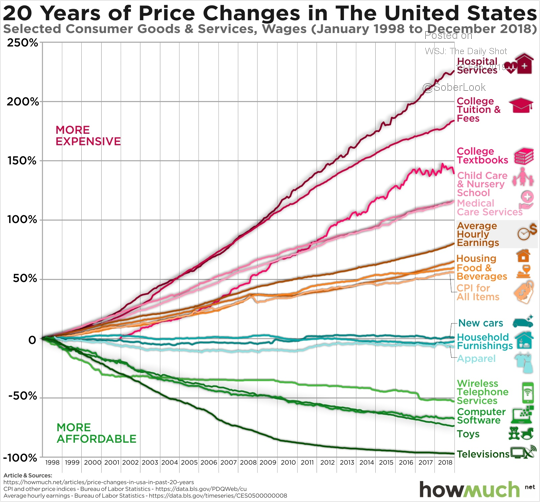 The chart below shows the price changes of select consumer goods and services in the past 20 years. In the US, all the basic needs for a human being have become costly in the past 20 years. These include items like hospital services, education, child care, college textbooks, housing, etc. On the other hand, all the wants items have become cheaper. These include TVs, cars, wireless phones, household furnishings, etc. This is a paradox of the current economic system that few economists and regulators would analyze. « Two Interesting Articles About The U.S.